Composites rainbow halos and/or glint-like rays at locations where the Source clip is brighter than the threshold. Lower the threshold parameter to produce glares in more areas. Use the Style menu to select different glare types. Set the Glare Res parameter to 1/2 for faster rendering with slightly softer glares. Use the Convolve option for smoother results. Glares are best observed on dark images with a few bright spots. Source: The input clip that determines the glare locations and colors. Background: Optional. The clip to combine the glares with. If no background is given, the Source is also used as the Background. Mask: Optional. If provided, the source glare colors are scaled by this input. A monochrome mask can be used to choose a subset of Source areas that will generate glares. A color mask can be used to selectively adjust the glare colors in different regions. The mask is applied to the source before the glares are generated so it will not clip the resulting glares. Style: Default: 0, Range: 0 or greater. The style of glare to apply. 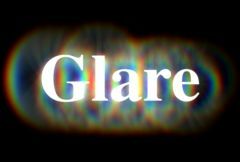 Custom glare types can also be made, or existing types modified, by editing the "s_glares.text" file. Determines the method for applying the glares to the Background. Scales the brightness of all the glares. Scales the color of the glares. The colors and brightnesses of the glares are also affected by the Source and Mask inputs. Scales the color saturation of the glare elements. Increase for more intense colors. Set to 0 for monochrome glares. Threshold: Default: 0.8, Range: 0 or greater. Glares are generated from locations in the source clip that are brighter than this value. A value of 0.9 causes glares at only the brightest spots. A value of 0 causes glares for every non-black area. This can be used to raise the threshold on a specific color and thereby reduce the glares generated on areas of the source clip containing that color. Threshold Blur: Default: 0.0896, Range: 0 or greater. Increase to smooth out the areas creating glares. This can be used to eliminate glares generated from small speckles or to simply soften the glares. Increasing this may put more highlights below the threshold and darken the resulting glares, but you can decrease the Threshold parameter to compensate. Size: Default: 0.8, Range: 0 or greater. Scales the size of the glares. This parameter can be adjusted using the Size Widget. Scales the vertical dimension of the glares, making them elliptical instead of circular. Rotates the ray elements of the glares, if any, in degrees. Adjusts the length of the rays without changing their thickness. Adjusts the thickness of the individual rays. Blur Glare: Default: 0, Range: 0 or greater. The glare is blurred by this amount before being combined with the background. Shifts the hue of the glare, in revolutions from red to green to blue to red. Glare Res: Popup menu, Default: Full . Selects the resolution factor for the glares. Higher resolutions give sharper glares, lower resolutions give smoother glares and faster processing. This 'Res' factor only affects the glares: the background is still combined with the glares at full resolution. Half: The glares are calculated at half resolution. Quarter: The glares are calculated at quarter resolution. If this value is positive the output Alpha channel will include some opacity from the glares. The maximum of the red, green, and blue glare brightness is scaled by this value and combined with the background Alpha at each pixel. Glare From Alpha: Default: 0, Range: 0 to 1. Set to 1 to generate glares from the alpha channel of the source input instead of the RGB channels. In this case the glares will not pick up color from the source and will typically be brighter. Values between 0 and 1 interpolate between using the RGB and the Alpha. Glare Under Source: Default: 0, Range: 0 to 1. Set to 1 to composite the Source input over the glares. Scales the opacity of the Source input when combined with the glares. This does not affect the generation of the glares themselves. Expand Borders: Check-box, Default: off. If enabled, transparent borders are added to the input image before processing. This allows the result to include soft edges beyond the original image size. When off, the effect only occurs within the frame and the result will retain an edge at the borders. Luma: uses the luminance of the Mask input to scale the brightness of the glares. Color: uses the RGB channels of the Mask input to scale the colors of the glares. Alpha: uses the alpha channel of the Mask input to scale the brightness of the glares. Show Size: Check-box, Default: on. Turns on or off the screen user interface widget for adjusting the Size and Rel Height parameters.